Win for Japan sets stage for a gold medal rematch against USA, Australia vs. Canada for bronze Sunday. 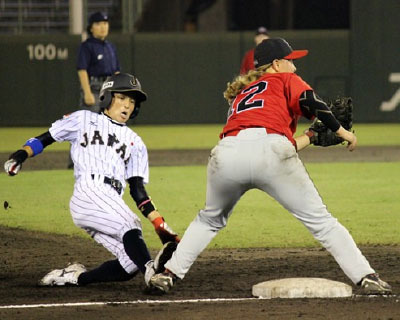 MIYAZAKI, Japan – Japan overpowered Canada, 12-2, in the Final Four of the ENEOS Presents VI Women’s Baseball World Cup, before a TV Asahi nationally televised audience and a global online audience via AYM Sports, whose internetv.tv platform provided an open (free) webcast the game in English, Japanese and Spanish. World No. 1 Japan wasted no time in growing a 3-0 lead versus T-No. 3 Canada, using a DH Yukiko Kon's bases-clearing double in the bottom of the first, after Canada’s starting pitcher, Daniella Matteucci, walked the bases loaded with two outs. Canada struck back with two hits and two runs in the top of the 2nd inning, highlighted by a mammoth blast over the right-fielder’s head by Lalor, to close the gap to 3-2 – and finally putting a dent into Japan’s pitching staff, which had not surrendered a run in 2014 World Cup action. Japan responded with two runs in the bottom of the 2nd, extending “Madonna Japan’s” lead to 5-2. Japan’s skipper handed the ball over to Ayami Satoh in the top of the 3rd inning, after a rocky start by Yukari Isozaki. Satoh went on to shut down the Canadian offense over the next three innings, while Japan’s hitters issued the early 5th round (inning) knockout, ending the contest 12-2 by way of the 10-run rule. With victories by Japan and the United States to open the Final Four, Sunday’s medal round match-ups have been decided. Three-time defending champions Japan and No. 2 USA will collide in what will be a rematch of the 2012 World Cup final. It will also be a 2012 rematch for bronze, as Australia and Canada duke it out for the hardware and rankings points (both are tied at No. 3 in the IBAF World Rankings); Canada will be out to defend the bronze medal on Sunday, while Australia will try to earn the Emerald's first-ever medal. Leigh Godfrey -- who competed on Australia’s bronze-winning women’s national softball team at the Women’s Softball World Championship in Haarlem, Netherlands in August -- has the opportunity of being the first player in history to earn a medal in both the women’s softball world championship and women’s baseball world championship.